Happy Monday! How was your weekend? Did you do any riding? I sure did and boy was it ever much needed. Not only did I get to get in 8 hours of riding this weekend but I actually got to visit a new place too! 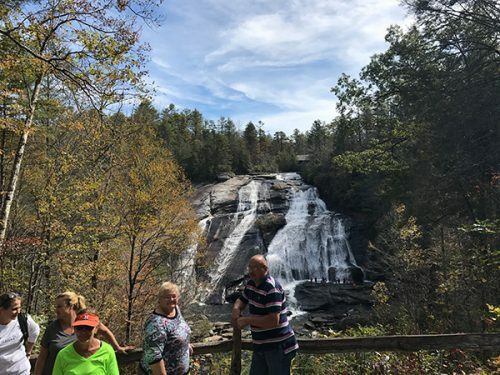 If you’re from NC or SC, you’ve probably heard of Dupont State Forest as a good place to trail ride. 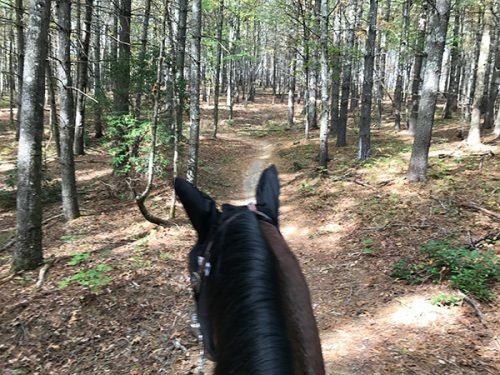 There are tons of trails with a few accesses to waterfalls from horseback. 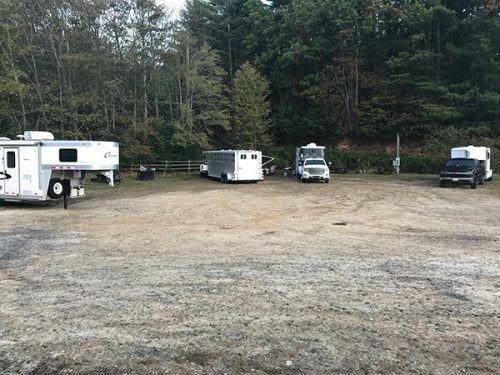 The only downside, depending on how you look at it, is the lack of horse camping facilities at Dupont. 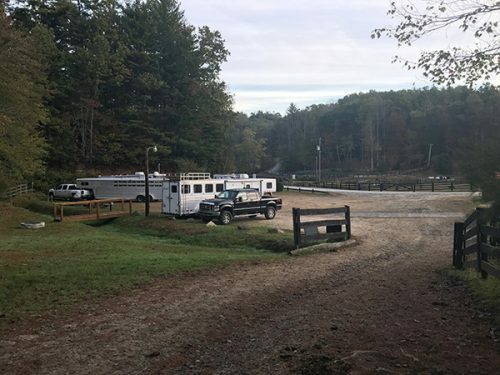 My research only turned up two, with Shoal Creek (the place that I stayed at) being the only horse camp that you could ride to the trails from and not have to trailer in. 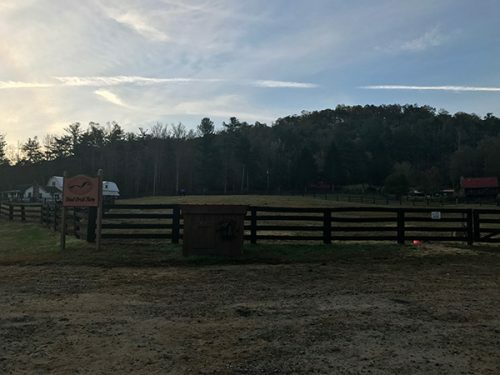 So without further ado, I want to share my experience of trail riding at Dupont and camping at Shoal Creek Farm with you. My camping and riding weekend started early Friday morning. 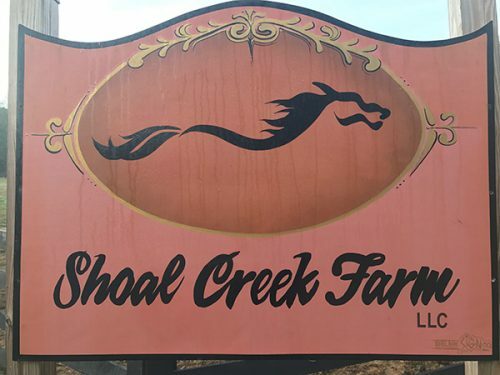 I left my house around 9:30am and arrived at Shoal Creek Farm around 1:30pm. Google Maps said the trip would take 3.5 hours from my house to Shoal Creek but it ended up taking 4 hours to get there and 4 hours to come home. Both times were early in the morning before traffic. Had I have waited any later, I would have hit major traffic on I-40. As I turned on the road Shoal Creek Farm is on and came upon it, I was actually surprised that the camping area was pretty small. My truck and trailer are extremely long, so had there of been other long trucks and trailers in there, I likely would have had a hard time getting into a spot. 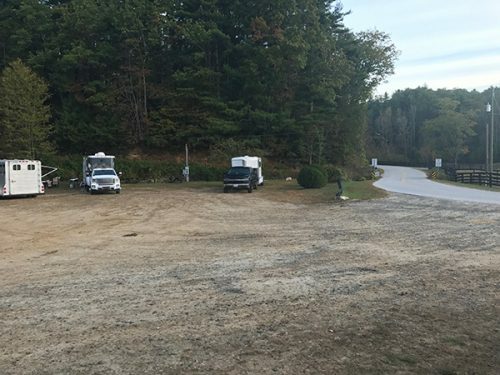 Luckily, myself and a couple other friends were the only ones staying this past weekend, so we had the whole parking lot to ourselves. It truly was a gravel parking lot too. 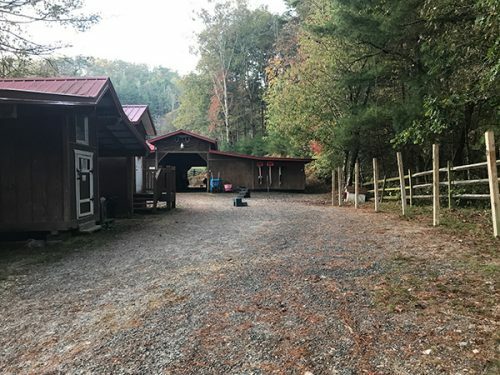 The parking lot is shared by the campers and by the people coming to the barn to trail ride, get a lesson or just see their horse. It was a busy little parking lot, that’s for sure. Once my friend and I got our horse trailers parked where we wanted them, Kyle (the owner) came down and greeted us. Super nice guy. His wife, Olivia, was really nice too. Kyle spent a few minutes showing us where everything was, where to put our horses, the trail map and checking coggins. Note: If you stay here, you must have a current Negative coggins. After that, the only time we saw him or his wife was when they were coming or leaving from the barn. They aren’t the type of people that make you uncomfortable by constantly watching what you are doing. 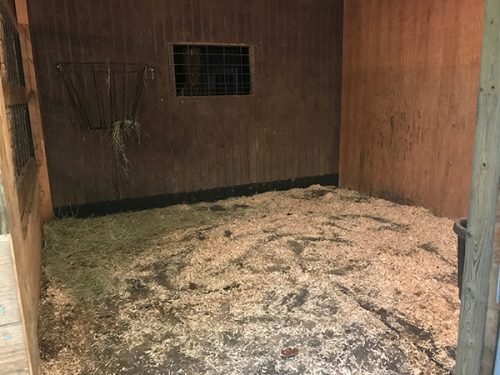 Usually when I camp I prefer a stall but this time I decided to go with a pasture so Gracie had plenty of room to walk around and not be confined to a stall. I’m not sure if that was the best idea or not though. The pastures don’t have water troughs because there is a nice size creek that runs through it. Brandi’s horse is use to drinking out of a creek, so she had no problems. Gracie never drinks out of a creek unless we’re trail riding, so I’m not sure she drank well all weekend. I’m inclined to think she didn’t and that’s why she was sucking down water out of a bucket every time I offered it to her. So if you’re horse is picky like mine, make sure you take a water bucket to leave out. The pasture itself was a great size and plenty of room for two horses. 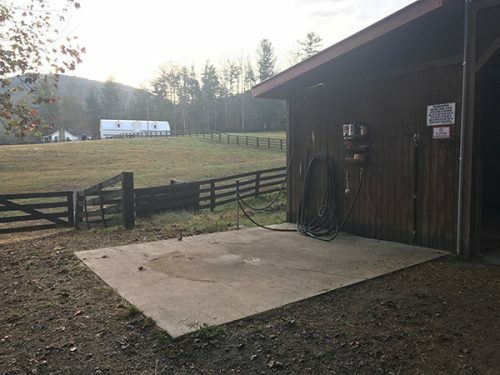 Now that I have a full LQ horse trailer, I technically don’t need a bath house but since there is no dump station I did use it to keep from having to find somewhere to dump my black tank. This bath house is by far the best one I have EVER been in. 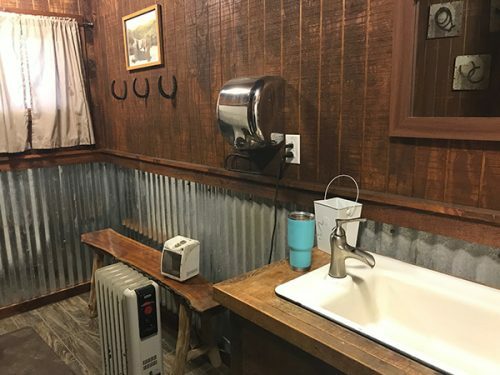 It was super super clean and decorated really nice. The only downside was that there is only 1. 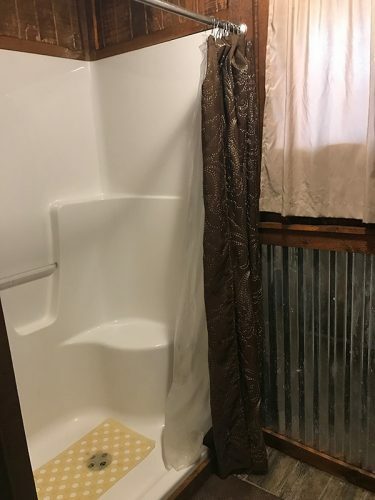 So if someone is showering and you need to use the restroom, you have to wait. It would be awesome if they would add one more bath house like this, so there could be two. Overall, Shoal Creek Farm was a nice place to stay but it’s far from being one of my favorites. 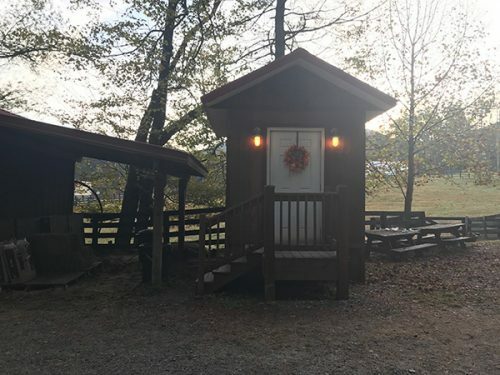 So far nothing tops camping at Leatherwood Mountains. I just feel like I’m totally in nature at Leatherwood and I didn’t feel like that at Shoal Creek. I honestly think it’s because you’re parked really close to the main road and your in a gravel parking lot. I prefer grass, trees, being surrounded by nature and not close to any other trailers. However, I have plenty of friends that did like this set up. So it’s all about what you like. 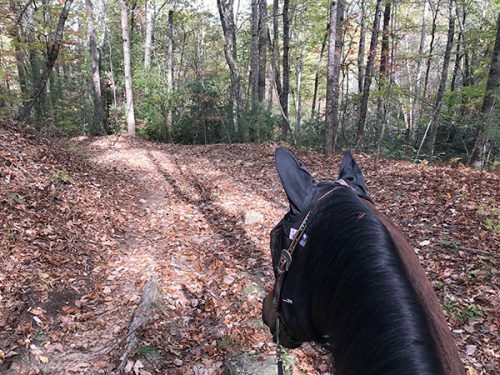 “Trail Riding at Dupont Forest is the Best!” That’s what I had been told by a few friends who have been there many times and consider it to be one of their favorite places. Unfortunately, it’s going to end up being a one and done for me. I just didn’t like it. 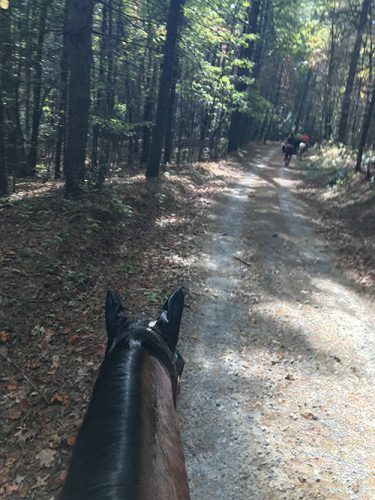 My favorite places to trail ride to this day are Leatherwood Mountains and Mt. Rogers. Both of those places have trails that are what I call true “horse trails”. They are small paths thru the woods which were made by horses. They also have beautiful views and you truly feel like you are in nature. I didn’t feel like this at Dupont. I felt like Dupont was a commercialized nature exhibit. 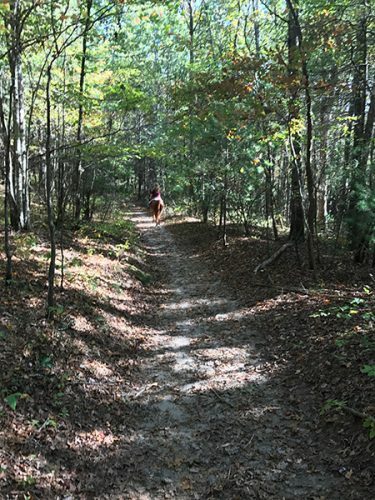 The trails at Dupont are considered “multi-use” which means they are shared by horseback riders, mountain bikers, hikers, people walking dogs, hunters and joggers. It’s a very busy place. The trails are very wide and more like winding dirt roads. Most of the trails actually are named _____ Road. However, there are some actual “trails”. No matter what road or trail you ride, it’s very likely you will come face to face with mountain bikers. Most of them are nice and respectful of horses and will stop (which they are suppose to do) but there are a few who will zip right past you. I had to learn the hard way, Gracie will spook at the bikers. She did not like when they came whizzing past her and was a little better if they were stopped. The first day of trail riding a Dupont was the worst day for her spooking. By the middle of day 2 trail riding, she was much better and barely flinched with they came by. According to the website there are 90 miles of trails/dirt roads at Dupont and 6 Waterfalls. I rode to 3 of the waterfalls and then had to call it a day because Gracie was acting a little weird. I got to see High Falls, Triple Falls, and Wintergreen Falls. High Falls and Triple Falls I could actually ride to and see from Horseback. However, the trails to get to these are shared by hundreds of hikers. It definitely is not the safest trail riding I’ve ever done. It didn’t feel safe for me or my horse or the hikers. There were many hikers who didn’t know anything about horses and would walk up quickly behind them or to their face and spook them. Thank goodness none of our horses kick. There were dogs that would get to close barking and jumping. Ugh. To say my anxiety was through the roof is an understatement. Here are a couple pictures I snapped while Trail Riding at Dupont. Sadly, I didn’t get many because I just didn’t feel like there was much to take a picture of. The scenery was pretty much the same on every path we took. At least that’s how I felt. Have you been trail riding at Dupont before? 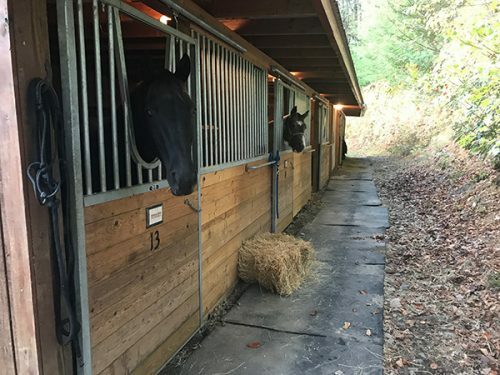 Have you ever stayed at Shoal Creek Farm? 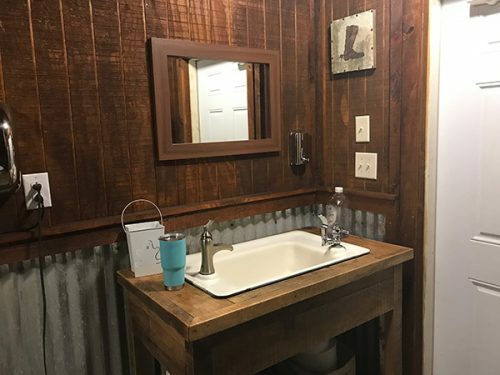 I'm a small town cowgirl living in NC. I have 11 animals: -> 4 horses: Te and Jet are retired, Gracie and Rumor I barrel race and trail ride. -> 4 Cats: Bentley, Midnight, Bama & Mommy Kitty. -> 3 dogs: Whiskey, Jack & Jill. Currently, I love barrel racing and traveling to new places to camp/trail ride. Aside from being a cowgirl, I am also a wife to a fireman, a co-founder of a construction business and a mom to a teenager. What a fun weekend! I bet it was so nice seeing all of the fall leaves too. I think that bath house is so cute. Love this! 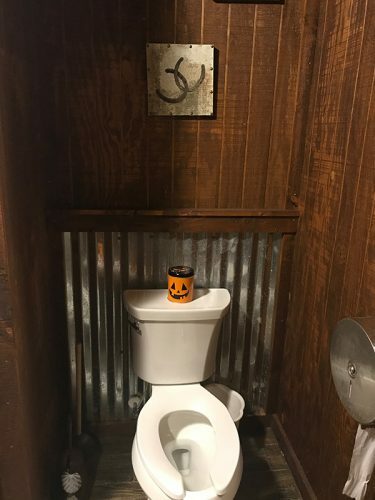 Those facilities and stalls look AMAZING! And so do the trails! Hello! My name is Ashley aka The North Carolina Cowgirl. 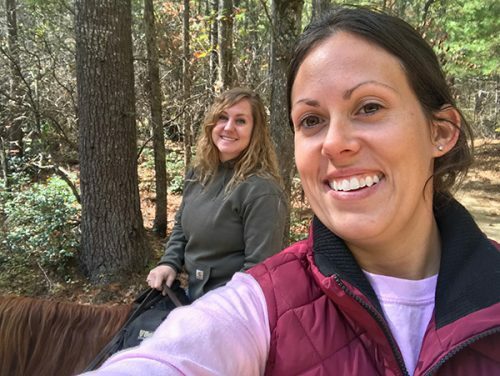 I use this blog to talk about things happening with my horses, product reviews, and anything/everything I love. 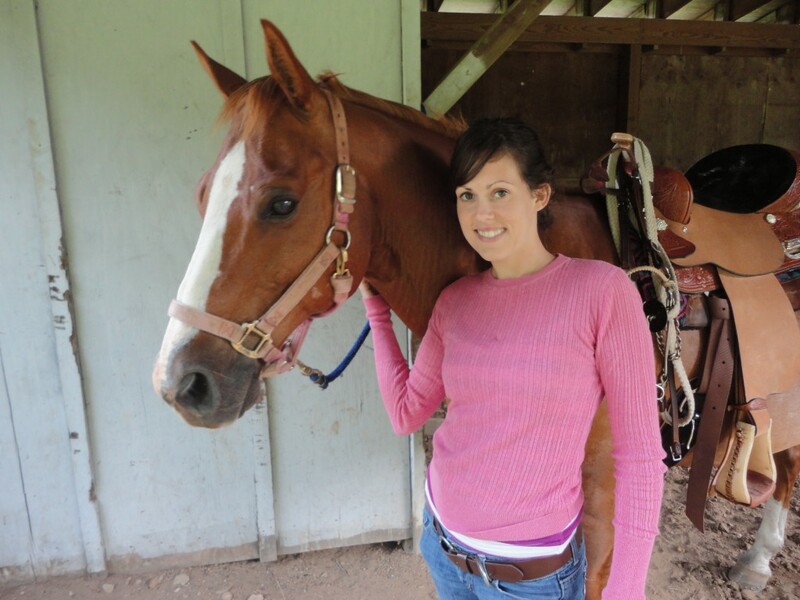 Visit The North Carolina Cowgirl's profile on Pinterest.